The Surefire U2 was smaller than alot of the photos on the web made it look. I would consider it just small enough to be considered a pocket light. I really liked the overall look of the light, and how it was designed. The knurling felt great, just like all Surefire products. The anodizing on the middle section of the head was alittle purple compared to the rest of the light, but other than that, the black HAIII anodizing looked great. I would consider the U2 just small enough for a pocket light. The head has a large diameter for a pocket light, but the length is not bad. The light is alittle more light weight than it appears. I EDC (Every Day Carry) mine, and do not notice it is even there. 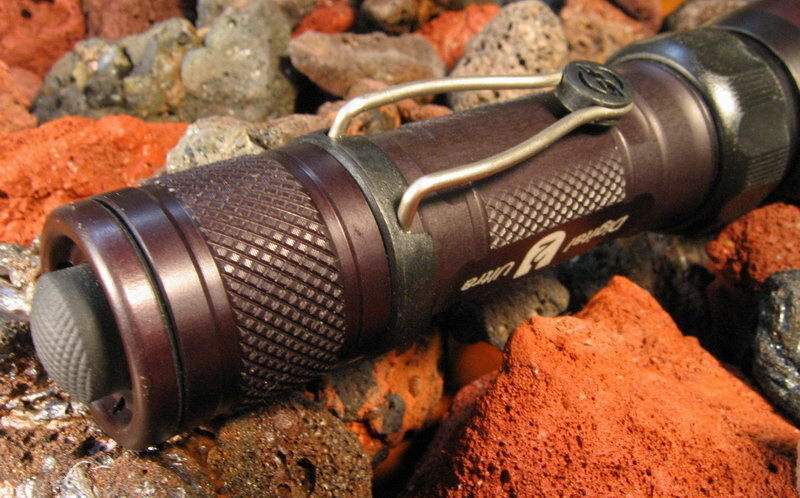 The U2 feels good in your hand, Surefires excellent knurling allows you to keep a firm grip even with wet hands. The U2 doesnt feel large at all when you are actually holding and using it. Its well balanced and can be comfortably held in quite a few ways. I placed a large rubber o-ring around the body of mine, just under the pocket clip. This gives the light alittle more flare to its shape toward the tail end. I can now hold it in a tactical or cigar manor. As is to be expected with all Surefire products, the U2 is very well machined. There are no rough or sharp edge, and the parts of the light fit together very well. The pocket clip is stainless steel and is a nice contrast against the black body. Head and tailcap are rubber o-ring sealed, and suitable for heavy rain and shallow submersion. Not recommended for diving. The biggest feature of the U2 is its 6 brightness levels. These are adjusted by a rotating collar located at the base of the head. Rotating the collar about 95 degrees will adjust the U2 through its 6 levels. The lowest level being about 2 lumens, and as mentioned before, the highest level being 80 to 100 lumens. I have had a few other lights that have a multi level system, but most of them use a series of button presses to toggle the brightness levels. This can make it alittle easier for one hand operation, but alittle more thought has to be put into remembering the combinations etc. For example, the Arc4 toggles between high and low by pressing the button twice in quick succession. Once you get the hang of it, its really not that bad, though when first using the light, it can be frustrating. if you dont double click it fast enough, it will turn off and on, instead of changing its level. The U2 is very easy to use. The clickie tailcap is used only for clicking the light on and off, or you may lightly press it for momentary use. The brightness levels are independently controlled by the rotating collar. I like having the level control separate from the on/off switch. One great advantage to this type of system, is that you can actually change the brightness level Before you even turn on the light. That way you can set the light to its lowest setting before turning it on, so you are not blasted with one of the higher levels, ruining your night vision. The levels can easily be changed when holding the U2 in a conventional manner. (thumb and fingers toward the head) Your fingers are naturally gripping on or near the adjustment collar. 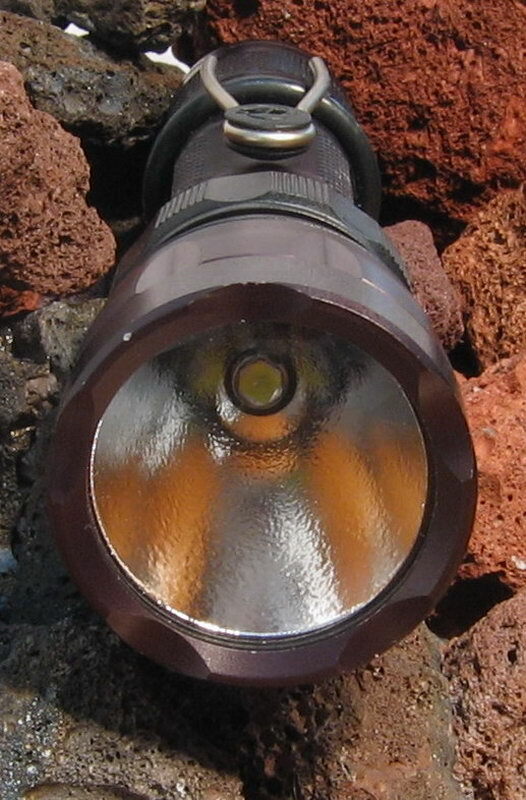 The U2 is rated 80 to 100 lumens. The reason for such a wide range is due to the "Luxeon Lottery". The U2 uses a 5W Luxeon LED, and as with all LEDs, they all vary in their specifications. This can make their color, brightness, and runtime vary. The U2 has an impressive beam for a 5W led light its size. 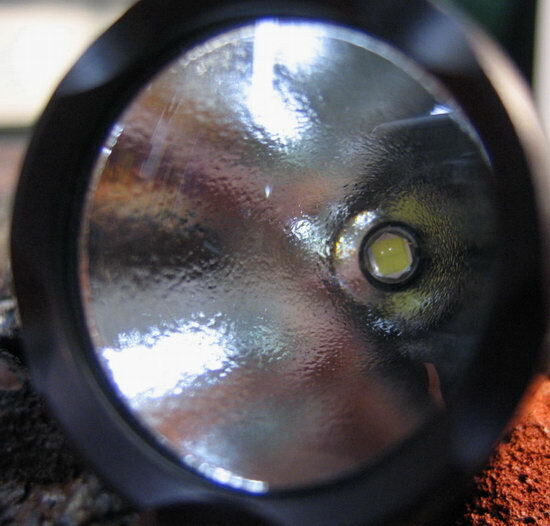 5W leds have a much larger die than 1W or 3W leds, therefore they are much harder to focus into a tight long throwing beam. 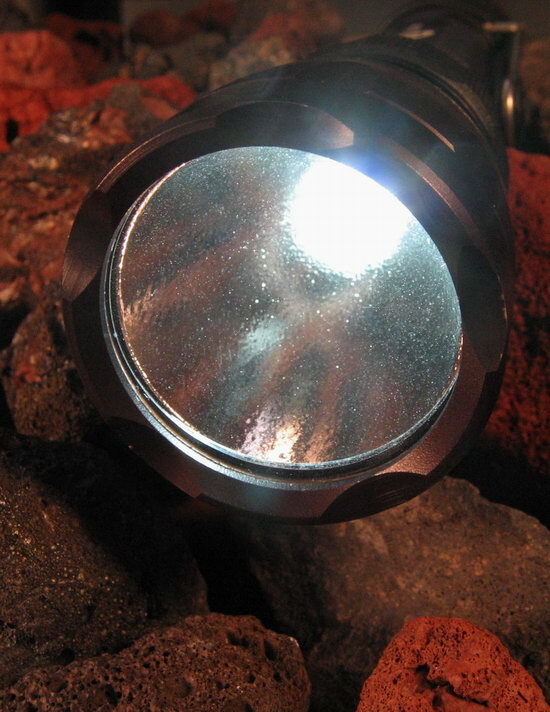 The U2 reflectors is rather deep for its diameter, so it does a good job of gathering up more light to the hotspot. This does however result in a smaller diameter of side spill light. Both the spill light and hotspot are perfectly smooth and artifact free. Some of the U2's were said to have "doughnut holes" in the hotspot of the beam. This is when the center of the hotspot is dimmer than the outer rim of the hotspot. Resulting in a doughnut shape. Mine seems to be ok, the center of the beam is only slightly dim, which is typical when using a 5W led with a reflector this small. I do however think that my U2 has the best 5W beam I have seen in a light this size. My U2 measured 1777 Lux on Level 6, and 177 Lux on Level 1, with 2 123 cells. The U2 will run over an hour on the highest level, and 40 hours on the lowest level. 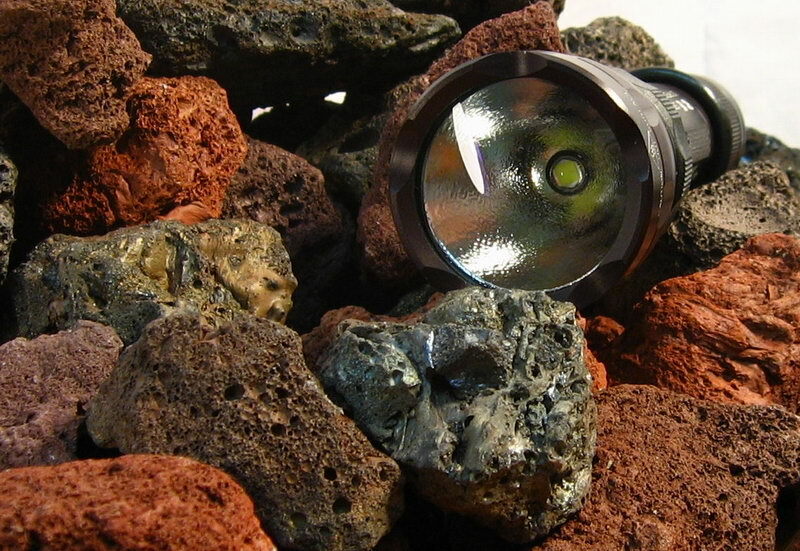 I use Li-Ion 18650 cells in mine. These are UNPROTECTED rechargeable lithium cells. They can be very dangerous if used in the wrong conditions. They must not be over discharged, or over charged. They are safe to use in the U2 because the light will not drain them lower than about 3.1V, the safe discharge for the 18650 cell is 2.8V. Typically, you want to cut them off at about 3V. My U2 ran for 1 hour and 30 minutes on one 18650 2400 mAh cell before it started to dim quickly. You have about 15 minutes of usable light after the U2 starts to dim rapidly. The U2 is a regulated light, this means its output stays rather consistent throughout its entire runtime, unlike many other lights that dim over then entire runtime. Level 6 (highest) does tend to dim slightly over its runtime though. Mine dimmed approximately 230 lux over the 1.5 hour runtime. The U2 does an excellent job of managing the heat created by the 5W led. Leds do not project heat out the front of the light like incandescent bulbs. But the base of the led itself does get rather hot, especially 5W leds. This heat must be draw away from the led to ensure it performs well, and to lengthen its life span. The U2 have a much larger head then the 5W Surefire L4, this makes it draw much more heat from the led, and also keeps the light itself at a much cooler temperature. The head of the L4 can get very hot, so hot its uncomfortable to hold if you leave it running while sitting on a table, and then go to pick it up. 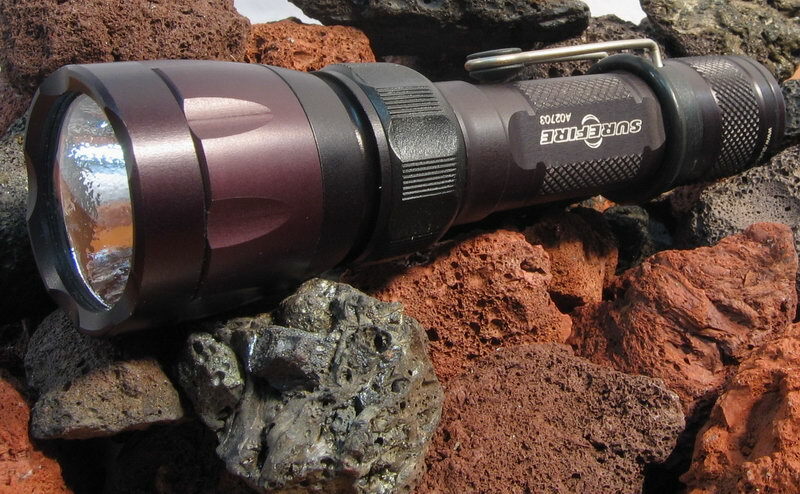 The U2 doesnt get near this hot, the light does a great job of drawing the heat all the way down to the tailcap. I found that the light seemed to stabilize its heat after about 20 minutes. It can still get rather ot if left on a table running, but its still touchable. Holding the light in your hand will keep the light much cooler. The blood circulating through your hand will draw heat out of the light. Your body acts as a larger radiator for the light. The U2 can be comfortably held throughout its entire runtime, even on the highest level. Able to use a variety of batteries. I was after a 5W led light, with multiple brightness levels, that was able to use a rechargeable solution. The U2 could not be better suited for my needs. It is just small enough for me to EDC, after a couple days I didnt even notice it. The output and beam are very reasonable for a 5W led, and a reflector this size. 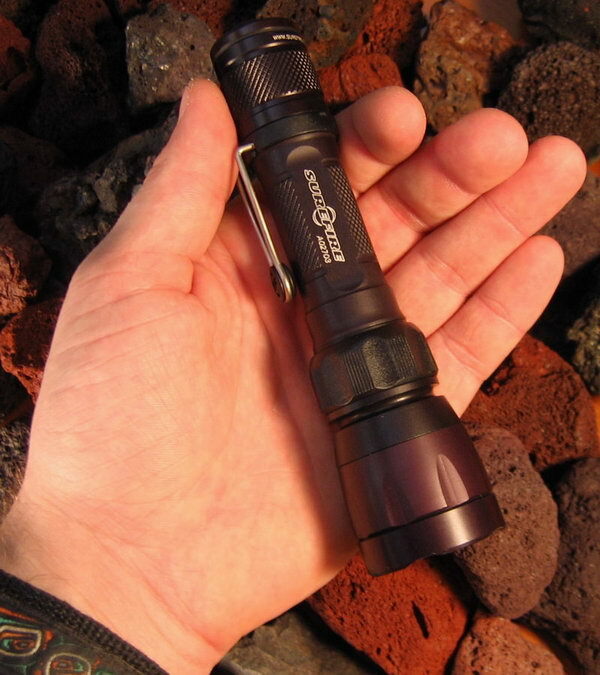 The 6 brightness levels are VERY useful, and make it like carrying multiple lights in one. I was use to bezel up carry, and was worried about the U2's bezel down clip, but I now realize that is much better for a light with a head this large in diameter. I placed a fat o-ring under the clip, right below the tailcap. This gives the U2 even better grip, and gives it more of a tactical feel. The ability to use bare unprotected 18650 cells was a big selling point to me. They are much cheaper than protected Pila cells, so i bought 5 of them to go with the U2. That gives me approximately 7 and a half hours at full brightness.